Dr. Maleki is a board certified electrophysiologist who is an expert in implanting defibrillators, pacemakers, biventricular device, loop recorders. She is also experienced in performing ablation procedures for atrial fibrillation, supraventricular tachycardia (SVT), and ventricular tachycardia. 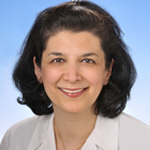 Dr. Maleki completed her Internship and Cardiology Fellowship at Cooper Hospital RWJ/UMDNJ. She finished her electrophysiology fellowship at St Luke’s-Roosevelt Hospital, Columbia University College of Physicians and Surgeons in New York. Dr. Maleki is on staff at Saint Peter’s University Hospital and Robert Wood Johnson University Hospital.